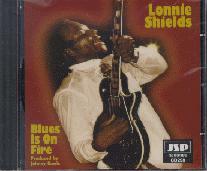 Lonnie Shields' plays the Blues with a heavy dose of Gospel. His early music experiences were as a Gospel singer and it shows in every performance. His listening preferences as a teenanger were Rhythm and Blues and Soul and these influenced his performing style as well. He cut his blues teeth performing with the Jelly Roll Kings. His recording career has led him through a number of studios from Memphis to Clarksdale. His guitar style is forceful and direct. His songs are about life in the Delta and they sometimes take an unexpected turn. Lonnie Shields career has skyrocketed over the past few years and he is performing all over the world. He was the first Delta artist that Rooster Blues picked up after moving to Clarksdale, Mississippi in 1987. His CD "Portrait" was released in 1992 and reads like a who's who of Delta Blues Performers. Since then he has gone on to release more CD's and build an impressive list of songwriter credits.